Authentic vintage decor for your home or office. "Since 2006, Mid-Century Memories has been selling vintage and mid century home decor. From the beginning, my goal has been to save one fabulous piece at a time. 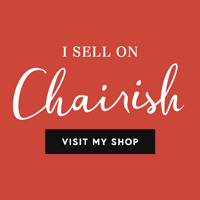 If you have a passion for 20th Century furniture, lighting, art and decorative accessories follow me, and my shop, as I seek out incredible and sometimes one-of-a kind finds." the 1920s through the 1980s. We offer seating, tables, paintings, glass, pottery, lamps and more! There are multiple shipping options available on this site, Chairish and eBay. See the specific item(s) for details. Visit MID CENTURY MEMORIES's profile on Pinterest.